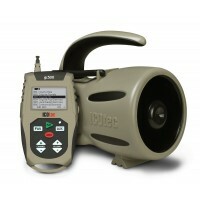 Looking through the Cabela’s catalog or any other outdoor or military gear website, you will find many different styles of camouflage hats, but only one is hands down the best for concealment and hiding the movement of your head as you scan the area around you looking for animals that are coming to the call. When you are calling and trying to get animals to come in close to you, you need to hide yourself and any movement you might make while looking for incoming critters. To visibly cover the entire area around you with your eyes, it is necessary to move or rotate your head from side to side. therefore you want to wear a hat that will not change your profile as you turn your head. It is very important to wear a camo mask, headnet or camo face paint while calling to hide your face, but you also want to wear a hat with a brim. A brimmed hat will not only keep the sun out of your eyes, but the brim will also cast a shadow over your face which will help conceal you. The hat to wear is the boonie hat. Since the boonie style hat has a brim all the way around it, your profile will not change as you move your head from side to side. Unlike a baseball style cap, which only has a brim on the front, the profile of the boonie hat looks the same from all sides. If you turn your head with a baseball cap on, your profile changes, which could lead to you being “busted” by any incoming animals. Another thing is, when calling predators using distress sounds, you will attract aerial predators like hawks and owls. While you are turning your head and scanning, your head may be mistaken for the prey species you are trying to sound like. 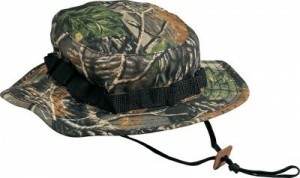 I came very close to getting my boonie hat taken off by a red-tailed hawk one day while using rabbit distress sounds. After hearing a hawk screaming above me, I looked up to see the hawk in full dive-bomb mode with talons stretched heading right down at me. Luckily he was as startled as I was when our eyes met and he veered off. If you turn your head slowly and deliberately and wear a boonie style hat, you’ll have a better chance of remaining invisible to incoming critters. Bonus Pro Tip: Do not wear a fur hat when calling predators.